making: ROBYN'S FETISH CHALLENGE #240 "ANYTHING GOES"
Good Afternoon!! I know I'm a little late and I would like to apologize for this. Since this is getting to you on a Tuesday I will just go ahead and get right to the challenge. This week's challenge is everyones favorite, "Anything Goes." I even like these challenges. Dragonsmoore, Spyder's Other Corner is our sponsor for this week. Go on over and see the cute images that they have. Right now there is a freebie that you can get. I was so grateful to use the image "Three Party Penguins." They are so adorable and they are walking in a line to go somewhere for Christmas. The little one's have something in their wings for Christmas. I can't wait to show you so let me tell you the prize so I show you my card. This is a really great prize for one of you to win this week. 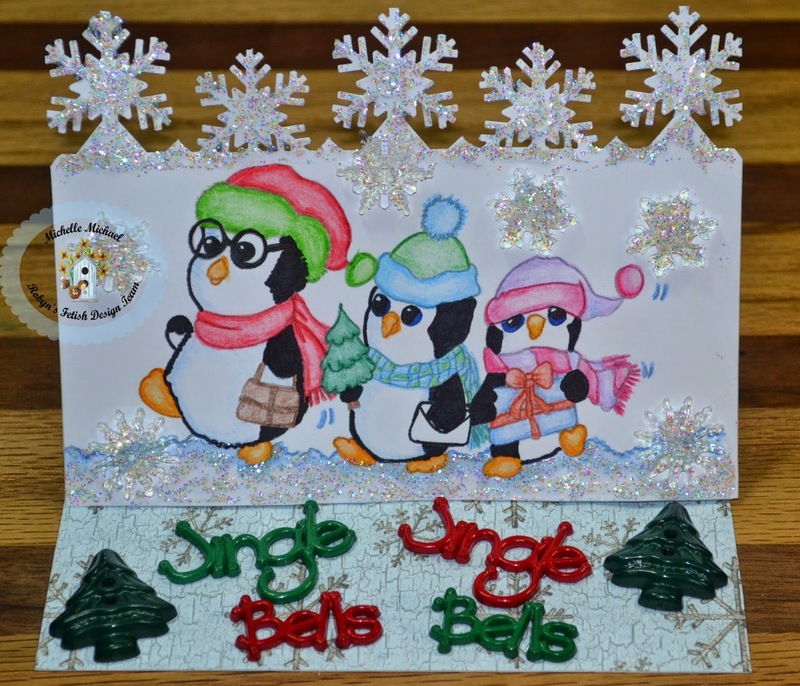 So, with these three penguins I decided to make and easel card that was different then I have been doing for a little while. I want to give my card a little change. So here is "Three Party Penguins." Are those penguins not precious. I had a snowflake edge punch that I used a the top and put some glitter on the snowflakes all over the rest of the card. I went through my box of embellishments and found the tree and the jingle bells saying. Just thought it was a good choice for the sentiment. Here are the items that I used to make this easel card. I also want to Thank Edwina from our design team for helping me with the measurements that I did forget to make one of these cards. Thank You for reading this even though I know it's late. Please enter the challenge over at The Robyn's Fetish Challenge Blog and see all the cards that the design team made for this anything goes challenge. See you next week.